Highly skilled and certified support engineers ensure that your solution is running at peak performance for maximum productivity. FOSS aims to have a world-class integrated service organisation providing the best possible support to our customers all over the world. More than 300 dedicated service engineers and application specialists are ready to provide fast and effective support in every time zone. Watch this video to get a quick introduction to FOSS Service. The industry’s best service coverage with more than 300 service engineers and application specialists operating from service sites in 28 countries. The fastest on-site response time to ensure low downtime for your solutions. Highly skilled and certified support engineers, ensuring that your solution is running at peak performance for maximum productivity. FOSS provides professional installation and commissioning services that ensure an optimal start with your new instrument. We have a selection of training courses available, explaining how to operate and maintain your instrument optimally. The courses are conducted by experienced FOSS instructors and are designed to make sure you get the most out of your FOSS solutions. Courses include basic and advanced instrument maintenance, trouble-shooting and an introduction to calibration and application development. The training can either be arranged at a FOSS office or at your site (depending on the instrument and the facilities of your local FOSS office). Please contact us for specific available offerings for your instrument. FOSS has the industry’s most skilled application and calibration support team, giving you the possibility to get professional guidance and support. Our expert Application specialists can deliver advanced calibration development to help you when developing new applications. 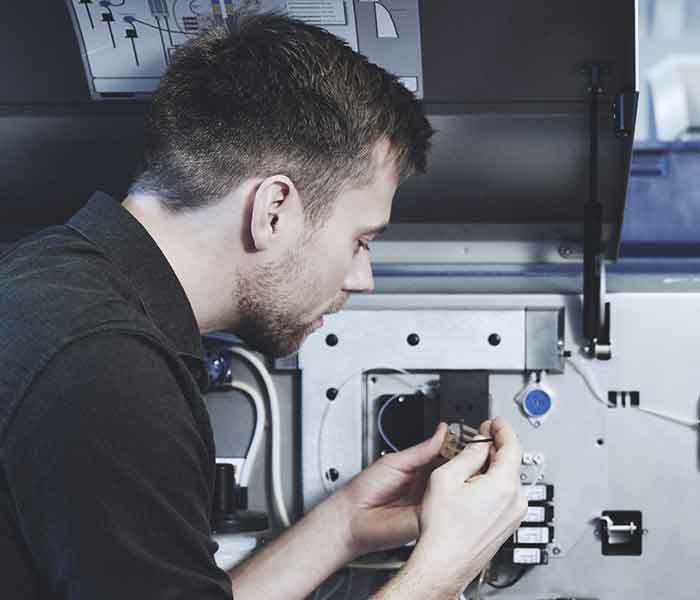 In many cases we are also able to offer bespoke calibration development. In the annoying event of an instrument breakdown, we have the industry’s best response time to bring your instruments back up and running. We have extended phone support hours. It is easy and fast to book a service visit. During the lifetime of your instruments you can rely on easy and fast delivery of spare parts, reagents and other needed consumables. We hold an extensive stock of genuine FOSS parts which can be expedited to your site within 1-2 business days. FOSS offers delivery guarantee of spare parts and consumables for 7 years after the instrument has been excluded from our product line. This promise protects your investment for many years. Please call us to discuss your options and pricing. Only FOSS can supply you with genuine FOSS parts. Laboratory Manager, Dr. Manja Delling at a German raw milk testing laboratory, explains how preventive maintenance helps to protect their business by keeping all instruments running perfectly on a daily basis.